After visiting your property and viewing the items to be sold, we may recommend that you consider an on site sale as one of the options available to you for selling your property. Our objective is to conduct a well organized and safe sale and to obtain the best possible price for your items. 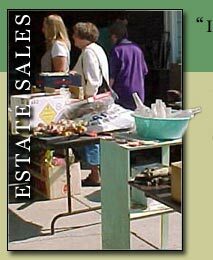 We will manage all aspects of the sale from set-up to clean-up, providing everything necessary for a successful sale. Advertising the sale. This will include placement on our website under "Upcoming Auctions and Sales"